From the front, the Spitfire x Seasons Skate Shop "Albany Burn Club" tee looks like any other Spitfire tee...until the back logo is reviled. Albany's own, Seasons Skate Shop, is back at it again with another tee-shirt designed with the Albany local crowd in mind. This time around, the boys at Seasons get a little help with Spitfire, a popular company that makes Skateboard wheels and accessories. Spitfire recently reached out to a number of Skate Shops around the country to include them in their latest customized Burn Club tee-shirts. 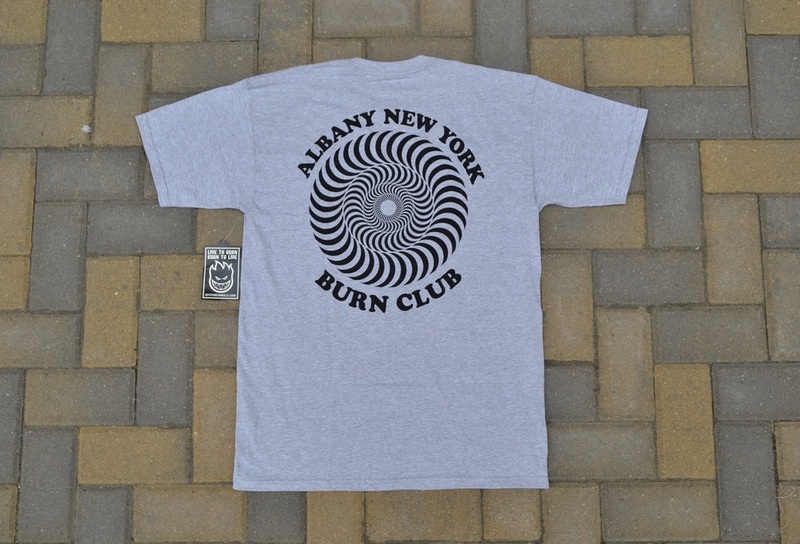 Based off what i've seen so far, Seasons chose to take a different route, electing to go with the Albany New York Burn Club script, versus including the shop name on the tee, which quite a few other shops did, just another example of how Seasons does things different, all while representing for the Albany skate community and Albany locals. The Spitfire x Seasons Skate Shop "Albany Burn Club" tee is now available at Seasons both in-shop and online in very limited quantities. I actually picked this one up about 2 weeks ago, but I have been so busy I haven't had a chance to post, with that said I would head over to Seasons at 211 Lark Street, Albany, NY to get yours while you still can. A big shoutout to the homies over at Seasons for always showing major love for Albany and its skateboarding community.